Post formats add visual variety to your blog by displaying different types of content in slightly different ways. The post includes this link to those WP.com themes that support custom post types. But What Exactly Are Custom Post Types? 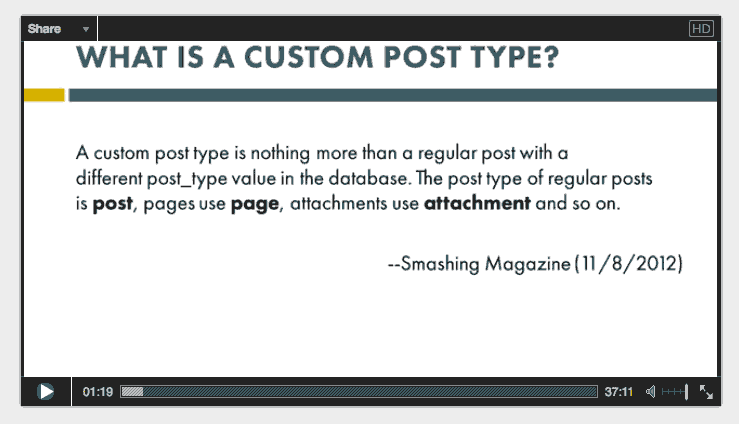 A custom post type is nothing more than a regular post with a different post_type value in the database. The post type of regular posts is post, page use page, attachments use attachment and so on. I love using Post Types, but, honestly, if they’re going to shlep up old posts, at least update it with current screenshots. That shot of the “New Dash” post editor is several iterations ago and, according to some, much more “user friendly” than the current one. Many themes support post formats, but don’t DO very much [if anything at all] when you use them. A theme like Twenty Twelve puts in a baby blue background-colour when you do an «Aside» post, if my memory serves me right. That’s kind of nice. But them again, you may want to change theme, and then it’s all gone. Twenty Eleven even has a widget [Ephemeral I think it was called], where you can get all your ‘Aside’ posts in the sidebar. Interesting. Have you seen the Watson theme from The Theme Foundry? It has an interesting set of effects for its custom post types. No, I’ve seen the name [isn’t it a premium theme in WP repository?] Will check it out now..